A few years back I reviewed the 2006 Firesteed Pinot Noir and you can visit those tasting notes by clicking the link. It's interesting that I'm just now tasting the 2005 when I tasted the 06' a few years back. We'll see how this wine is holding up after 6 years. I've had aged Willamette Valley Pinot Noir in the past, but every producer and bottle is different so we'll find out how well this wine has aged. The first thing to note is the color of the wine, which at the present is still quite red in color with only the slightest bit of discoloration towards the rim of the wine. There doesn't seem to be anything in the way of browning or brick tones. On the nose I get some really cool vegetable notes that combine with a background of red fruits; like red raspberry and cranberry. The most noticeable characteristics right after pouring the wine are chalk, sage, and hints of spearmint. I love these aromas and to be perfectly honest they remind me of Pinot from Burgundy. I distinctly remember smelling this exact menthol and mineral bouquet on a Savigny-les-Beaune Premier Cru that I tasted a few years back. On the palate the wine shows some delicate flavors of red raspberry and hints of bitter cranberry. There doesn't seem to be a whole lot of acid or tannin left in this wine and on the finish there are some earthy mineral notes and hints of sour cherry. We find some great Pino Noir here in New Zealand as well! Great review. 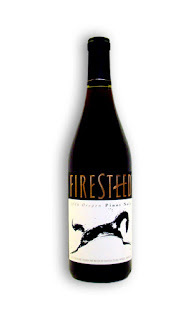 I recently tasted the 2009 Firesteed Pinot Noir and thought it was recommendable. Thought, not nearly as complex as the 2005 review would suggest.